It’s been awhile, but we’ve finally pushed out new versions of Reaction101 and Yield101, both now upgraded to version 1.1. 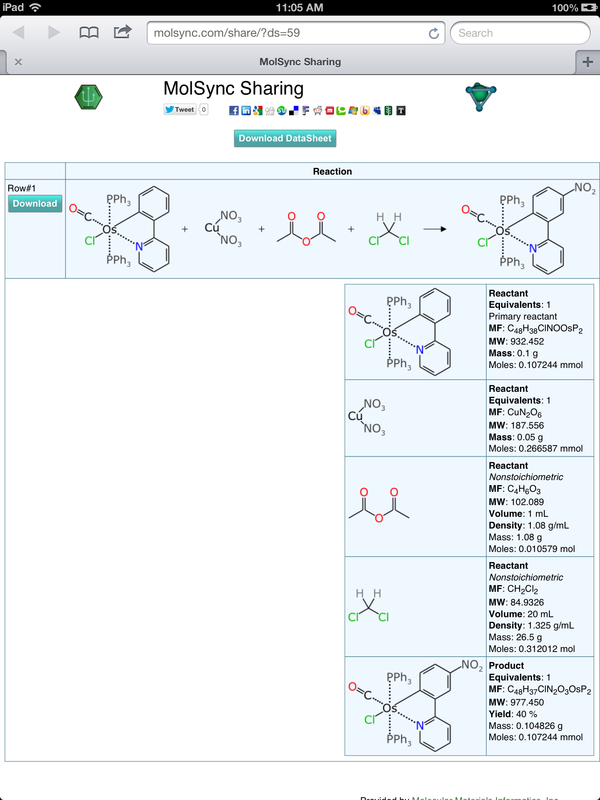 Apart from a general update with all the improvements/bug fixes in the underlying libraries, the major additions are the ability to share reaction schemes on the web, and the choice of sketchers to use. 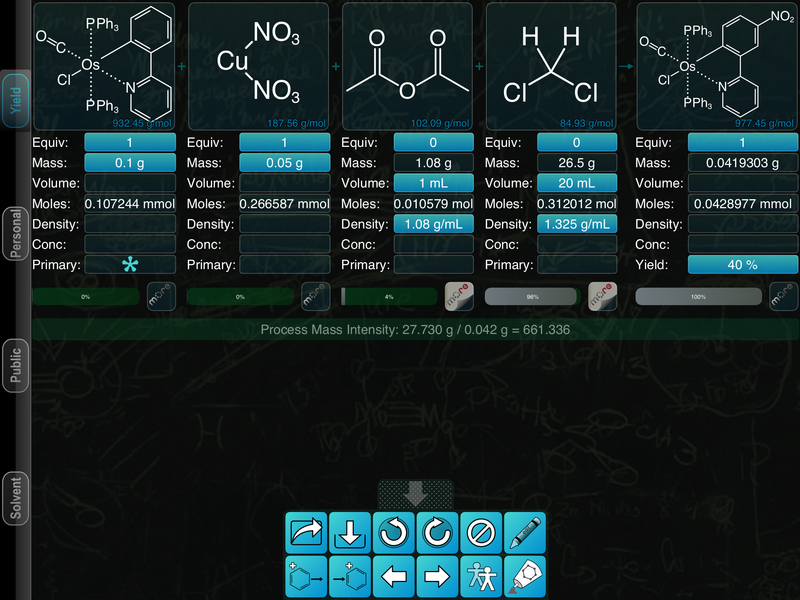 Shown above is a screenshot of Yield101, after having entered in a reaction that I did back in the day. The quantities are from memory, since the physical labour required to actually open my dusty old PhD thesis seems excessive in the information age, and even though it was 15 years ago, it’s probably still representative. It shows an osmium-based metal complex with an organometallic 2-phenylpyridine ligand. The special property of this starting material is that the benzene ring is activated in the meta and para positions, and the effect of the metal makes electrophilic substitutions possible under extremely mild conditions. Stirring it up with a bit of copper nitrate and a little squirt of acetic anhydride tacks on a nitro substituent at zero degrees celsius. Note that the diagram makes use of several collapsed abbreviations, such as PPh3, NO3 and NO2. These inline abbreviations are handled intelligently, and give rise to the correct molecular formula, which is critical for the calculations that the app provides. The two liquids (acetic anhydride and the dichloromethane solvent) are taken from the solvents list that is embedded within the app, which saves us from having to look up the density. The link is http://molsync.com/share/?ds=59, which you can check out now, if you like. The sharing capabilities of molsync.com have been improved so that they now expand out the individual components within a yield scheme, so that it’s possible to see all of the entered and calculated quantities. The link can be shared by any means, as well as tweeted, facebooked, etc. 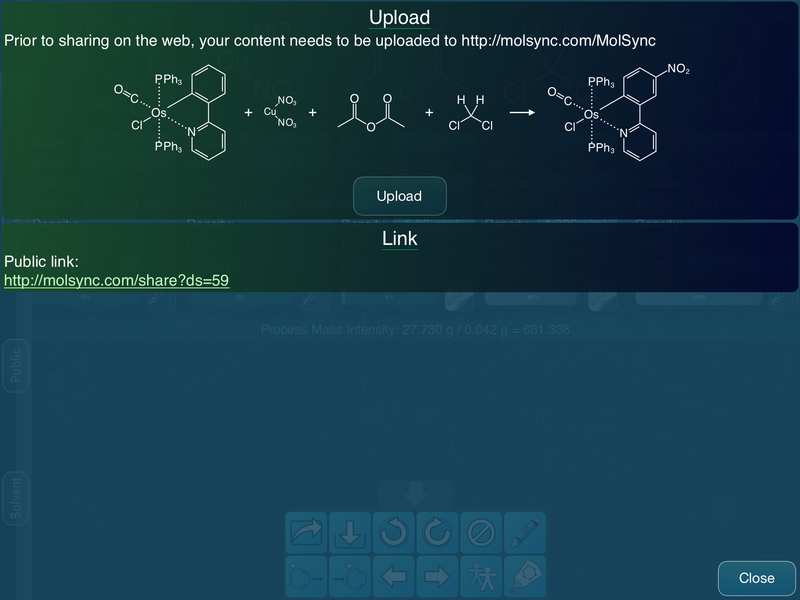 If you dig deeper, you’ll find that the Download buttons allow you to download the data in whatever cheminformatics formats apply, or render it in various graphics formats (though mileage will vary when it comes to including the finer details of the quantities).